We have officially done it — used our Zipcar membership for the first time. Although we attempt to utilize public transportation, or our feet, for nearly everything, this last Tuesday we just couldn’t do it. We had a 2:15 pm school pick up, after which we had to race to buy soccer cleats and shin guards for Zoe. Next, we flew across the river to a 3:30 pm doctor’s appointment for Zoe. At the end of that, we commandeered a bathroom where Zoe had to change into her soccer clothes. Back into the Zipcar we went and I dropped Zoe off at a Portland Streetcar stop where Tom and Zelda were waiting. The hubby and I switched kids right there on the street corner, with Tom taking Zoe to her first soccer practice since returning to the US (she loved it). Zelda and I were entrusted with returning our lovely Zipcar, which occurred without mishap. After soccer practice, we had a Blazer game to go to, so Tom and Zoe hotfooted it to Hot Lips Pizza, where she changed out of her soccer gear, and then they caught the Max to the Rose Garden. Meanwhile, Zelda and I walked over the Broadway Bridge to the arena — something I would have never done if I had a car. 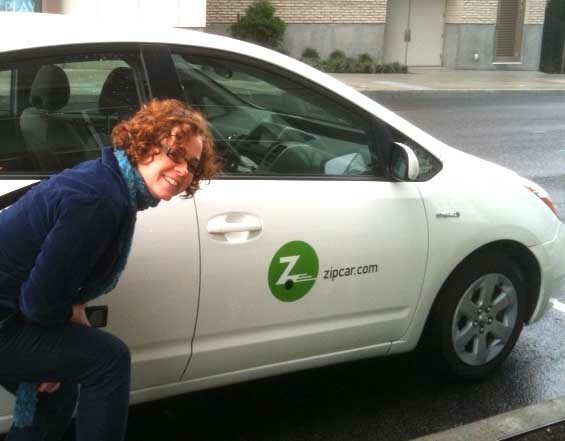 Anyway, our first experience with Zipcar was fabulous. We drove a Prius and it was really fun to maneuver around town. It had separate little buttons to start the car and to put the car in park. The gear shift was a kind of video game joy stick thingy in the dash. We had about a page of instructions on the newfangled stuff, but it was all well explained and we returned it on time (which is something you worry about since they charge you an arm and a leg if you’re even the slightest bit late). One of the interesting things we’ve noticed about participating in a car share versus owning our own car is that it really quantifies, by the hour, the cost of operating a vehicle. And I mean the whole cost, not just the gas! Having the real cost of driving spelled out for us really motivates us to try and avoid it as much as possible! This entry was posted on Thursday, January 7th, 2010 at 11:49 pm. You can follow any responses to this entry through the RSS 2.0 feed. You can leave a response, or trackback from your own site.